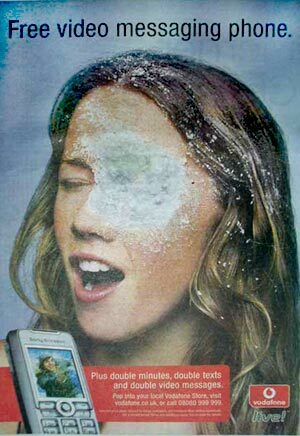 While we're sure Vodaphone intended this image to convey the shock a woman might feel after having a snowball land on her face, others feel it's an expression of joy following receipt of a certain climactically delivered thrust of Christmas excitement. And who are we to disagree with such a brilliant assessment? In fact, advertising imagery should always be this attention getting. The ad appeared in several UK papers Tuesday and The Register offered it's suggestion for a better tagline, "Free video messaging phone: because Santa comes just once a year." Nod to Rick for this.